In-form Millwall blew the race for second place and automatic promotion in League One wide open with a stunning win over Leeds at Elland Road. 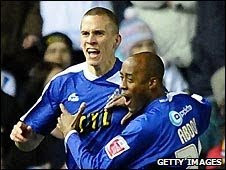 Steve Morison made it six goals in four games on 11 minutes when he fired in at the far post after fine build-up play. The home side were on the back foot in the early stages as the rampant Lions pushed forward looking for a second. Leeds settled and had chances either side of half-time but substitute Shaun Batt wrapped up the win on 80 minutes. Batt latched on to a throw in and cut inside from close to the corner flag, beating two men before firing a low shot that somehow squeezed past Leeds keeper Casper Ankergren at his near post. Leeds were without their 21-goal top scorer Jermaine Beckford who missed out with a hamstring injury and they needed to be at their very best to cope with a Lions side who have now won 10 of their last 12 league games. Millwall were 21 points adrift of Leeds in January but are now three points behind in the race for second place, with both Charlton and Swindon only one point behind the Lions. The Yorkshire club have been in the top two since August but four wins from their 13 league games in 2010 means the prospects of being dragged into the play-offs, where they lost last year to Millwall, is now very real. Batt's goal was a blow for Leeds who had created opportunities as they recovered from an uncharacteristically shaky start. Leeds's slow start got worse when defender Patrick Kisnorbo exited on a stretcher after collapsing in agony in the build-up to the opening goal. The Australian defender suffered a suspected Achilles injury and is likely to face a long period on the sidelines.